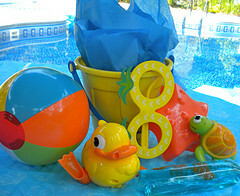 A kids beach party is a great pool party theme for kids of all ages. 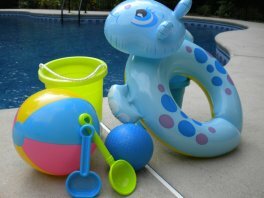 With easy props of sand buckets, pool floats, beach towels and beach chairs, decorating is a breeze. Serve kids favorite snacks in new beach pails, use beach towels for your tablecloth and have lots of beach balls floating in the pool to greet your guests. I've also made inexpensive invites using beach themes stickers and colorful card stock paper. The invitations set the theme for your next pool party. 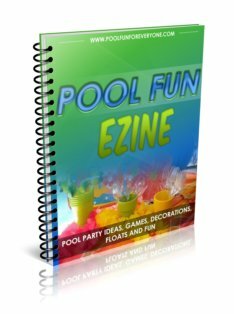 Include clever pool party wording like "Make a Splash at Laura's Beach Party," "Let's have some fun in the sun ..." or "Ocean's of fun at Caleb's Pool" or "You'll have a Ball at Jamie's Beach Party." 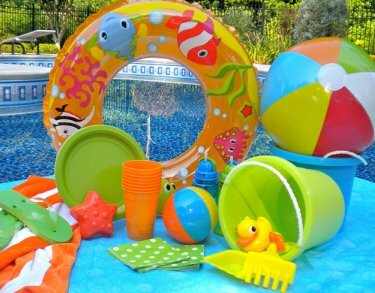 Beach party decorations for a kids beach party can be inexpensively bought - be sure to include colorful beach balls, towels, sand buckets, shovels and sand toys. Start your beach party decorating at the entrance to your pool - the pool gate. We always decorate the gate for all of our pool parties. 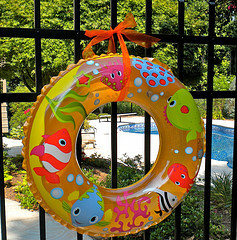 Drape a colorful beach towel on the gate and then hang a brightly colored swim ring on it tied with green ribbon. 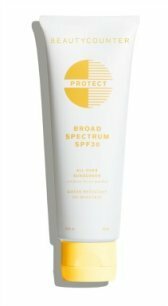 You could also hang a bright colored beach hat or beach bag with a towel hanging from it. 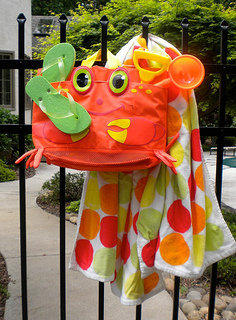 This bright orange Melissa & Doug Crab Beach Tote Bag is stuffed with beach gear - towels, sunglasses, flip flops and beach shovels. You don't need to go buy anything special, use what you already have at home. If you have some sea shells you've collected from trips to the beach, scatter some on the sidewalk leading to the pool area. In this picture I simply have 3 blue napkins tucked into 3 bright sand buckets. Place beach toys, small flip flops or sea shells around the buckets. Use a beach towel as the tablecloth. Hang colored paper lanterns from your outdoor umbrella or in trees near the party action. Have lots of beach balls floating in the pool - at least enough for each guest to have their own ball. Make sure they are at least 12" and if you have a really large pool and the kids are older get the 16" one. They can then be taken home as party favors. Write the names of each of the guests on the ball with permanent marker. One of the first games to get the kids into the pool (not that they need any help) is to go find the ball with their name on it. 12 Beach Ball Inflates - Approx. 16"
This inflatable surfboard can do double duty first as a prop set up at the entrance to the pool area and later for beach party games. A surfboard-shaped air mattress using 10 gauge vinyl for durability and a colorful gecko design lets the crowd know the Surf's Up and everyone is ready to party. Inflated it stands 6' tall so kids, teens and adults can use it for a float and beach party games. Get two of them to use for pool party races or for beach party decor around the food area. 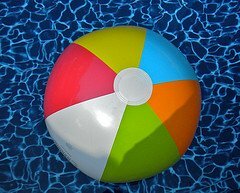 Have a giant beach ball sprinkler spraying water in every direction near your pool or party entrance. This one of course just connects to any standard hose and sprays water from the top and sides up to 15'. Inflate it first and then connect to the hose. 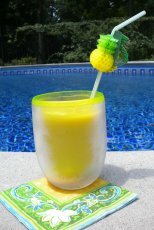 An inflatable beach ball cooler is fun, colorful and most importantly keeps drinks and beverages nice and cold. Inflated it measures 28' in diameter. Simply inflate, fill it with ice and then add your favorite drinks. Everyone can serve themselves to make for an easy but fun way to host a beach themed party. 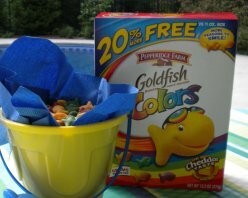 Place a colored napkin in a new sand bucket. Serve snacks like Goldfish, Chex Mix, trail mix or chips in the bucket. Finger foods are the best beach party food for kids - so include slices of watermelon or fruit kebabs and sandwich cutouts in the shape of a fish or sailboat. Cut up vegetables and serve with a ranch dressing dip. Fruit smoothies are a big hit with kids. Make and serve a healthy smoothie that tastes great and is good for your little guests. Beach Balls Our niece went to a friend's beach party and they started the festivities with this beach ball game. 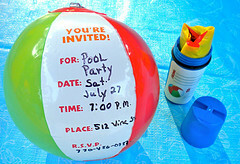 Write the name of each of the guests on a beach ball and toss them into the pool. To get the kids into the pool, they were instructed to go find the beach ball with their name on it. The kids took their beach ball home as a party favor. Make up teams of two and give them each a beach ball. Start playing some lively music. Team members toss the ball back and forth to each other. The team that keeps their ball up the longest without dropping it in the pool is the winner. Play fun age appropriate music on your iPod with speakers and two at a time see who can hula hoop the longest. Each team is given a different color bucket - i.e. the red team and the blue team. Have one half of the team on one end of the pool and the other half on the other side. Each player swims with his bucket and hands it off to the next team member. That team member swims to the other side of the pool and hands the bucket to another team member. The team that finishes first wins. At the start of "go" each team member hops on their swim ring and swims to the end of the pool and back and gives the swim ring to the next player. The team that finishes first wins. 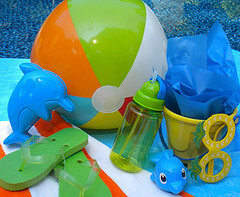 Beach party favors from beach balls to beach toys, are a take home reminder of a fun time together. Send the kids home with beach party favors that include a small bag of Goldfish treats, plastic fish finger puppets, squirt fish, a small beach ball, or a fun straw or sunglasses. Use small metal sand buckets and embellish them with the child's name, a beach themed sticker and a little ribbon. In this picture, I tucked a navy blue beverage sized napkin in the bucket instead of tissue paper. 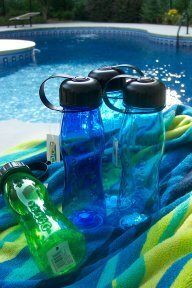 I found these aqua blue and lime green water bottles just the day before I was hosting a beach pool party. The tags were left on so that each guests name was written on a water bottle and then placed at their table, serving as a name place setting. The water bottles added a lot of color to the table and served as beach party decorations. You can find lots of fun water bottles at the dollar store - some with frog faces or with fun colorful designs. As favors for a kids beach party use little inexpensive plastic sand buckets and line it with colorful tissue paper, a napkin or tulle. Embellish the bucket with the child's name or a foam sticker. 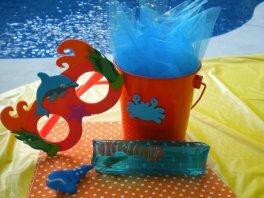 Some ideas for favors are fun sunglasses, squirt fish, little bags of Goldfish treats, beach toys, fish straws, or small deflated beach balls. Orange metal pails are lined with aqua blue tulle and embellished with a foam crab sticker. Fun beach themed glasses or real sunglasses can be used as favors. Find them at your local dollar store or at Oriental Trading. Get cheap beach balls and have them inflated and floating in the pool when the guests arrive. Buy enough so that there is at least one ball for each guest. Let the guests take one of them home. From beach balls to beach pails, beach party favors are a great way to send off your guests with a pleasant reminder of a fun time together. Cupcakes are the perfect dessert for a kids beach party. 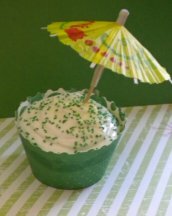 They can be decorated with sprinkles of crushed graham crackers for sand with a party parasol inserted in the frosting. Look for cupcake toppers that are not necessarily made for that purpose. 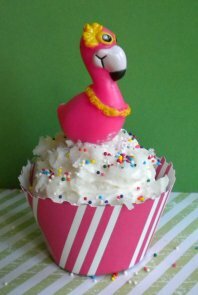 Here is a plastic flamingo finger puppet that came in a set - perfect as not only cupcake toppers but serves as fun party favors as well. Although I can't find these cute luau finger puppets on line anymore you could use a beach ball cupcake pick. I always use cupcake wrappers (they are placed over the cupcake liner) that match the party theme colors. Cupcake liners fade after they've been baked. The wrappers are put over the liner. Serve the cupcakes in a cupcake stand. So simple to serve them - no cake to cut and no need for plates and forks. Here is a simple way to make a two layer round cake into a beach ball cake. 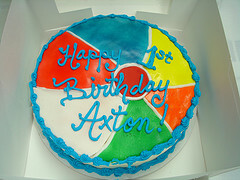 Frost the cake with different colors and use a white frosting to make the lines of the beach ball. Put the center of the beach ball off to the side. This beach ball cake picture is compliments of lisacupcakes.com from flickr.com. Throwing a kids beach party is easy with a little preparation and planning. 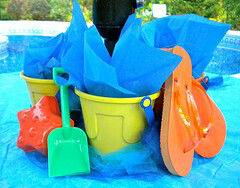 Build excitement with fun invites and remind guests of happy memories with beach fun party favors.